Winter can be harsh on your skin, lips, as well as other areas of the body. Particularly, it can leave your skin flaky, itchy, and dry. It can also lead to a dull complexion, skin irritation, and cracked lips. Thus, you need to follow a proper skin care regime to combat the dryness of your skin. Besides, your diet also plays an important role in maintaining a healthy and glowing skin while helping to lessen wrinkles as well as other aging signs and enhancing smooth and glowing skin. 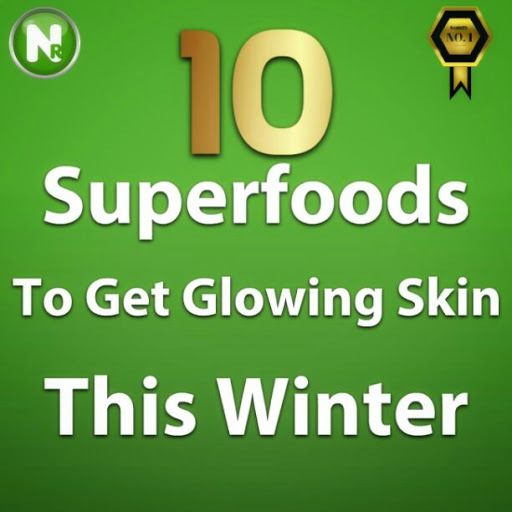 Now let us have a look at Get Glowing Skin this Winter with these 10 Superfoods. According to a study, consuming chocolate regularly can confer significant photo-protection, thereby protecting the skin from harmful UV effects. Besides, dark chocolate is rich in cocoa content, which is considered good for your skin health. Particularly, flavonols, which are antioxidants that can fight free radicals, increase blood flow, and keep the skin supple and soft. All you need to do is to eat 2-3 oz. of dark chocolate every week to reap the advantages of beautiful and glowing skin. In addition, you can make a face mask by taking one bar of dark chocolate and melting it in a double boiler. Then, mix in 1 tsp. of milk cream and gram flour with some lemon juice. After that, apply the mask all over your face. After 20 minutes, rinse it off with warm water. Repeat once a week. Avocados are loaded with vitamins A, C & E, as well as monounsaturated fats, all of which help the skin lock in moisture. This fruit is also high in magnesium, potassium, and folic acid that are essential for a healthy skin. Apart from that, avocados can decrease the appearance of wrinkles and fine lines so that they give your skin a youthful, firm appearance. For visible results, you should eat avocados regularly. You can also make a face mask by taking a ripe avocado and scooping its flesh out. Then, mash it properly and mix in 1 tsp. each of olive oil and honey. Thereafter, apply this on your face. Leave it on till it dries, then, remove using warm water. You can use this mask a couple of times weekly. Another option is to use avocado oil to massage the body prior to taking a bath. Spinach contains many nutrients needed to combat natural aging process of the skin. Due to its lutein, spinach gives the skin protection from sun damage. Furthermore, this vegetable is rich in vitamin A, which can keep the skin healthy and improve your skin tone. Also, it helps repair skin cells and keeps the skin looking beautiful thanks to its vitamin C content. You can prevent irritation and dry skin by drinking about half a glass of spinach with some lemon juice every day. Another choice is to include spinach in salads, soups, and other dishes. Carrots are one of the excellent home remedies for dry skin; because they are rich in potassium. Being packed with vitamin A as well as other antioxidants, carrots can keep your skin vibrant, glowing, and healthy during the winter days. Besides, they have the capacity to prevent aging signs such as pigmentation and wrinkles. Due to their carotenoids beta-carotene & lycopene, carrots help protect the skin against UV damage. Keep your skin hydrated from within by consuming 1 glass of carrot juice every day. Alternatively, mix 2 tsp. of pureed carrots, several drops of olive oil, 1 tsp. of honey, and 1 tsp. of milk cream to make a paste. Then, apply this mask on your clean face and rinse it off after 10 to 15 minutes with cold water. Apply this face mask several times per week to enjoy glowing, soft, and moisturized skin. Generally, grapefruit is high in vitamin C, which can fight off free radical damage. Furthermore, it consists of lycopene, which keeps the skin smooth. It also contains the potassium, which can prevent age spots and wrinkles. In addition, this fruit can make your skin softer and more firm thanks to its amino acids. Apart from that, grapefruit possesses the unique phytochemical named naringin that can decrease toxins in the liver, resulting in healthier skin. Simply consume fresh grapefruit juice on a daily basis during the winter. Alternatively, you can make a grapefruit face mask by mixing the juice of half a grapefruit, half a cup of oatmeal powder and 1 tbsp. of honey. After that, apply this mask to your face and let it dry. Finally, use lukewarm water to wash it off, and pat dry. Almonds are great for your skin during the cold and dry winter days because they contain powerful antioxidants. Besides, they are also loaded with anti-aging agents, which help to decrease fine lines, wrinkles as well as other signs of aging. Apart from that, vitamin E content helps nourish and hydrate your skin and protect it from the damaging UV rays of the sun. Take a handful of almonds and soak them in water overnight. Then, peel and grind them. After that, add some yogurt or milk to make a paste. You can use this scrub once or twice weekly. Alternatively, you can massage your body with almond milk or almond oil before taking a shower. This will help you get a glowing and radiant complexion. As we know, salmon is rich in omega 3-fatty acids that help nourish skin from within. In addition, it contains mineral named selenium, which gives the skin protection from harmful UV rays. In Addition, zinc in salmon has the ability to enhance the production of the new skin cells. For best result, you should eat two servings of salmon each week. You can also opt for baked or grilled salmon to enjoy clear, smooth, and glowing skin. Broccoli can do wonders for your skin because it is full of skin-boosting ingredients such as vitamins A and C and natural estrogens. Vitamin A helps to prevent skin damage caused by sun exposure and protect the skin cell membranes while the B vitamins help to remove dry, flaky patches. Besides, vitamin C has the capacity to enhance collagen production, thus keeping your skin healthy. Therefore, you should eat this vegetable regularly to get glowing skin this winter. Alternatively, you can opt for roasted, steamed, or blanched broccoli. A study found that green tea contains anti-inflammatory and anticarcinogenic ingredients that could fight a variety of skin problems. Besides, green tea is able to combat free radical damage to the skin thanks to being rich in antioxidants. As a result, it can prevent the dryness of your skin and improve your complexion. Additionally, green tea contains polyphenols, which can prevent and lower the premature aging signs such as age spots, wrinkles, and saggy skin. You should consume two to three cups of green tea every day. In addition, splash some cool green tea and onto your face. After that, rinse your face using cool water. You can also prepare a homemade exfoliating mask by taking a used green tea bag and mixing its contents with some honey. Apply this mask onto your clean face and rinse it off after 10-12 minutes. Repeat 1-2 times weekly. Olive oil is packed with vitamins A & E, and some other minerals & natural fatty acids so that helps hydrate the skin. As a result, it maintains elasticity and softness of your skin. It also gives the skin protection from free radical damage and prevents the appearance of fine lines and wrinkles. You can use olive oil in cooking and salad dressings. Alternatively, you can also take a little olive oil and warm it. Then, rub this warm olive oil over the face and other areas of the body before taking a bath. Finally, pat your skin dry. You will attain a soft and smooth skin after this application. In fact, you can easily get glowing skin this winter season by including these foods in your diet. If you know other foods to make skin glow, please share with us in the comments box below.